I recently discovered a new favorite recipe. It is easy and quick and it tastes ah-mazing. I found the recipe online one night when I wanted something tasty and my husband was gone for the evening. Not that Joshua was the tasty thing I wanted. or...maybe he was...but that is beside the point. I had coconut, cocoa powder, and almonds. I also had oats. And did not want to use flour. Put margarine, milk, sugar, and cocoa in a sauce pan. Bring to a boil over medium high heat. Reduce heat and continue to boil for five minutes. Remove from heat and and stir in vanilla and almond extract. 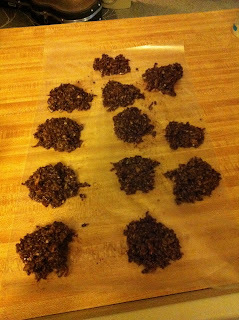 Stir in oats, coconut, and almonds and drop by rounded spoonfuls onto wax paper and let them cool and harden. My Mom makes these a lot for baby showers and people go nuts over them! If only the knew how easy they are!